try from O'Neill, thirty-five miles away. In the fall of 1901, he sold his livery business, and the following spring gave up the hotel, since which time he has given his time to conserving his financial interests, consisting of a considerable amount of the stock of the First National Bank of Spencer and its subsidiary institutions, besides being largely interested in choice real estate here and elsewhere in the county. Mr. Woods is a son of James and Mary (Englebart) Woods, the former one of the famous forty-niners, who went with the thousands to seek gold, and from which trip he never returned, his death occurring in California. The mother remarried and passed away in Texas, where she and her husband had settled about the beginning of the civil war. Mr. Woods was married in Minnesota, in 1868, to Mrs. Lizzie G. Parker, and they had four children: Willie James, Luther T., and Frank W., of Spencer, and Ethie, who married Edwin John Barnes and lives at Parsons, Kansas. Mrs. Woods died at Stuart in 1889. Our subject was united in marriage the second time, at Madelia, Minnesota, to Miss Elida Farnsworth, one son being born of this union, Lynn Woods, now cashier of the branch bank at Gross, Nebraska. Mr. Woods is a republican in politics, and a leading members of his party. He is a member of the Congregational church, and fraternizes with the Masonic order at Spencer. Wilbur M. Speer is an old resident of Custer county, where he is well known and has various interests. He owns a large farm, some town property, and is interested in the creamery industry in Comstock. He is one of the few who never lost faith in Nebraska's future during the hard years of drouth and poor crops, and has prospered well in his various enterprises. He was born in Rutland, Dane county, Wisconsin, December 20, 1861, the only child of John D. and Sarah(Lockwood) Speer. The father was a native of Michigan, moved to Wisconsin and from the latter state enlisted in the union army, dying while in the service, January 16, 1861. The mother was born in Vermont and died in Dane county in 1884. Mr. Speer reached young manhood on the Wisconsin farm and learned the trade of blacksmith. He was married at Paoli, Wisconsin, on February 22, 1879, to Miss Edna C. Warner, a native of Wisconsin, and one child was born of their union, Joseph A., married and living in Minneapolis. After marriage Mr. Speer continued work at his trade for a few years and served as constable of Rutland for a time. Mr. Speer was there married (second), May 25, 1884, to Caroline M. Owens, who was born in Brooklyn, Wisconsin, and they made their first home at Albany, Wisconsin. In the spring of 1888 they came to Custer county and pre-empted one hundred and sixty acres of land on section twenty-nine, township eighteen, range seventeen, Douglas Grove township. They proved their title to this land and sold it, later living in Dry Valley for a number of years. In the spring of 1900 they purchased three hundred and twenty acres of land on the south half of section two, township eighteen, range eighteen, which is now the home place. It is well equipped as a stock and grain farm, and in 1905 Mr. Speer erected a modern residence, barns and other suitable buildings. He has held various local offices and for the past eleven years has been moderator, director and treasurer of school district number fifty-two. He is a prosperous and successful farmer and business mail, owning six hundred acres of land, and has for many years specialized in breeding horses, having raised some of the best trotters in the state. For many years he has taken a threshing outfit over the region and is one of the best known men in his part of Nebraska. Six children were born to Mr. and Mrs. Speer: Cora E., wife of Clifford Roth, lives in Comstock and has two children; Percy W., married and living in Westcott, has two children; Elza A., John E., Frank E., and Zella L., at home. Mrs. Speer's father, Ephraim Owens, was born in northern Wales and came to America in 1866, locating in Albany, Wisconsin. He died in that state in 1910. His wife, whose maiden name was Eleanor Meredith, was also born in northern Wales, and now resides in Albany. Mrs. Speer has a sister, Mrs. Jennie Hattel, and a brother, George H. Owens, living in York county, Nebraska; one brother, Thomas P., in Comstock; and two sisters, Mrs. Emeline Shaffer and Mrs. Cora Williams, in New York and Wisconsin, respectively. Alex Lamb, an influential and wealthy agriculturalist of Howard county, Nebraska, resides on his elegant farm in Kelso precinct, his dwelling place being on section twenty-three. He has accumulated his snug fortune by push and energy, and his high station as a farmer and citizen is richly deserved. He was born in Roxburgheshire, Scotland, May 25, 1845. Mr. Lamb was the fourth member in a family of five children born to Alexander and Mary Lamb, and grew up in his native country. In 1869, he struck out for himself, coming to America, and stopping in Kalamazoo, Michigan, during that summer. on Oak creek. April 6, and were the first actual permanent settlers in the county. Their first dwelling was a shanty which they erected on George Irvine's claim, and there the four men "batched" together in true pioneer style. Each went to work with a will to improve his farm, Mr. Lamb remaining on his original homestead from that time to this. He has purchased land at different times, and now owns three hundred acres, all of which is in the finest possible condition, and he has successfully engaged in grain and stock raising business. Mr. Lamb has passed through the actual pioneering days of Nebraska, and was one of the first party of white men to cross the Loup river and locate a fording place. During those early days their nearest trading place was Grand Island, and he has many a time carried plow shares to that point to be sharpened, also well remembers grub packing Grand Island days. On October 9, 1891, Mr. Lamb was married here to Sopha Miller, who is a native of Iowa, and one of the early teachers in Howard county. They have reared two children, Alexander W., and Walter M., and have lost two little ones. 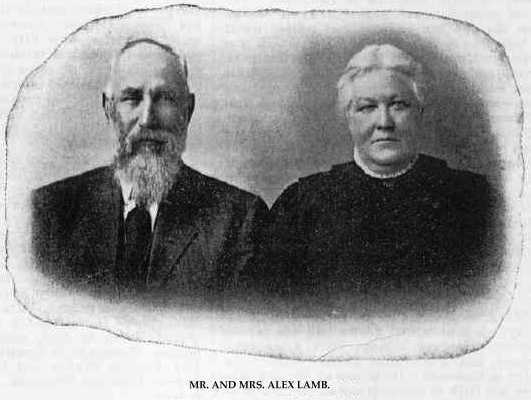 Portraits of Mr. and Mrs. Lamb appear on another page. Mr. and Mrs. Alex Lamb. Frank Peter, one of the enterprising agriculturalists and worthy citizens of section twenty-six, township twenty-five, range two, Pierce county, Nebraska, is a man of industrious habits, progressive in his chosen work, and the owner of a good farm. Mr. Peter has become successful through his strict integrity and honest dealings, building up a comfortable home and gaining the respect of his fellow-men and is known as one of the solid citizens of Pierce county, where he has resided for the past twenty years. Mr. Peter was born in Stoeckow, province of Pommerania, Germany, December 7, 1862. His father, Carl Peter, born in 1834, was superintendent on a large estate in Germany. When a young man he served his time in the army, and was called to arms in the war between Austria and Germany, in 1866. He died in 1909. Our subject's mother, Henrietta Luedke, was born in the same province as her husband and about the same year, and died in 1892. Mr. Peter received all his schooling in Germany, and learned the trade of harness making in the city of Frizow. In the spring of 1881 he sailed from Bremen to Baltimore in the "Leibsig," making the passage in eighteen days. He depended upon common labor, drifting from one place to another; five years were spent on the range in Wyoming and Utah, riding horseback from Larimy to Ogden, thence to Salt Lake. He finally settled in Madison county, Nebraska, where he lived nine years, farming the last season on rented land; coming thence to Pierce county in 1890, where after renting five years, he bought the land he now owns in 1894, and took possession the following year. Mr. Peter was married October 6, 1887, to Miss Amelia Heckmann, who was born in Wisconsin, but whose parents, Godleib and Caorlina (Hilsberg) Heckmann, were natives of Germany, born near the Oder river some twenty miles from Berlin. They moved from Wisconsin to Nebraska in 1875. Four children have been born to Mr. and Mrs. Peter, named as follows: Minnie, wife of Alfred Bauman, a farmer of Pierce county; Sadie, Otto and Frank. Mr. Peters is numbered among the leading old-timers of this region and has gained the respect and esteem of his fellow-men, all of whom admire him for his strict integrity. Politically he is a democrat, and he and his family are of the Lutheran religion. The gentleman above mentioned has for the past forty-four years been closely identified with the development and growth of Nebraska, and particularly Howard county, where he has passed through all the various phases of pioneer life, and is known as a leading educator and man of affairs in his county and state. N. J. Paul is a native of Meigs county, Ohio, born July 27, 1841. He grew up in that vicinity, remaining there until his twenty-first year, then came to Kansas where he engaged in school teaching. He spent the years of 1863 and 1864 in Kansas, and then returned to Ohio, but after one year went back to Kansas, locating in Leavenworth county, and coming to Omaha, Nebraska, in 1867. There he became connected with the office of the surveyor general of Nebraska, and followed the work of a surveyor. He was United States deputy surveyor and contractor for government surveys, and filled the position during the first survey of many of the Nebraska counties. In this work be became thoroughly familiar with the early history of Nebraska, and no man here has a better knowledge of those times and the progress made than he. During this time he was also connected at times with the land department of the Union Pacific Railway Company. In 1871, Mr. Paul located in Howard county, homesteaded on section thirty-four, township fifteen, range ten, and still owns this place, which is situated just outside of the corporation limits of St. Paul, and on which he has a commodious residence and every improvement. tional Bank, Mr. Paul being one of the original organizers, and has been continuously engaged in the banking business up to the present time. He is now president of the St. Paul State Bank, which succeeded the St. Paul National Bank in 1897, and is among the solid institutions of its kind in the state of Nebraska. Our subject was one of the first county commissioners of Howard county, and also was the first probate judge, receiving the election in 1871. During 1880-1884 he served as county treasurer. He was a member of the Nebraska legislature, elected in 1876, and a well known man in politics throughout the state. Mr. Paul was the second child in a family of seven, both parents being natives of Pennsylvania, the father dying in Meigs county, Ohio in 1881, and the mother there also, in 1890. On coming to Nebraska, Mr. Paul was accompanied by his brother, James N. Paul, who is equally known throughout the section. Mr. Paul was married on February 19, 1876, at St. Paul, to Miss Lucile Holman. To them were born two children, both now deceased. Mrs. Paul died September 8, 1887. In 1893, Mr. Paul was married to Abigal E. Boswell, and she died two years later, leaving one daughter, Pauline, now a charming young girl. Mr. Paul has been prominently identified with every movement started for the advancement of the commercial and educational interests of his city and for thirty-five years has been secretary of the St. Paul school board. James B. Hughes is one of the early settlers of Valley county, Nebraska, who have been able to acquire a competency and retire from active life. Mr. Hughes was born in Sullivan county, Indiana, August 13, 1850, seventh of eight children born to Hampton and Nancy (Patton) Hughes. The father, of Irish descent, was born in Kentucky, and died in Indiana in 1888, and the mother, also of Irish descent and a native of Kentucky, died in Indiana about 1855. They have a daughter in Lincoln, Nebraska, two sons in Indiana, besides our subject; others of their children are deceased. The education of James B. Hughes was acquired in his native state, where he grew to maturity and engaged in agricultural pursuits. On January 20, 1880, he married Miss Katherine Smith, a native of Knox county, Indiana, and in the fall of 1888, brought his wife and two children to Valley county, securing a homestead of one hundred and sixty acres of land near Arcadia, the home place for a number of years. He was successful in his operations and developed an excellent farm, adding to his possessions and becoming a prominent citizen of the community. He now owns four hundred acres of land, containing substantial buildings, the house being located on section fifteen, township eighteen, range sixteen. In March, 1910, Mr. Hughes purchased fifteen acres of land within the city limits of Arcadia, where he has since resided, retired from more active life. Eight children were born to Mr. Hughes and wife, namely: Ralph, whose wife died in May, 1910, lives at Sheridan, Wyoming, and has two children; Belle, wife of Daniel Thompson, of Valley county, has three children; Roy, of Valley county; Harley, married and lives four miles north of Arcadia; Curtis, of Valley county; Nellie, married Claud Dalby and they live in Valley county; Philip and Earl, at home, attending the Arcadia schools. Mr. Hughes passed through the usual hardships of pioneer life, and by his perseverance and success won a good standing in his community, and the respect of all. The first seven years he lived in a sod house on his homestead claim. The times being hard in western Nebraska, Mr. Hughes removed with his family to a farm he rented three-fourths of a mile from Lincoln, and was in town when the memorable blizzard of January 12, 1888, broke over that part of the state. Facing the suffocating blast, he made his way safely home, more fortunate than many exposed to the icy wind. Deer were plentiful in the early days, and of these Mr. Hughes killed five. Mr. Hughes served several years as director and treasurer of school districts numbers sixteen and nineteen. He is a republican in politics. Timothy N. Terry, an old settler in the northeastern part of Nebraska, has done his full share in the upbuilding of this region, and his name will go down in history as one of those who spent the best years of their lives in assisting to develop the agricultural and commercial resources of the section in which they reside. He lives on section ten, township twenty-four, range four, Madison county, where he has a good farm of four hundred and eighty acres and a fine home, where he and his family are surrounded by a host of good friends and many acquaintances, and are esteemed by all in the community. Mr. Terry is a native of Jefferson county, Wisconsin, born March 13, 1843, a son of John and Elizabeth (Nichols) Terry. The father was born in Connecticut of English descent, his people coming from England in 1650; the mother was a native of Massachusetts, of Scotch-Irish descent. Captain E. G. Miller and command of General F. J. Harrell. The battles participated in were at Prairie Grove, Vicksburg, Fort Morgan and Spanish Fort. In 1869 Mr. Terry came to Madison county, Nebraska, where he took up a homestead, also a preemption claim. He first built a log house in which the family lived for three and a half years, when a better and more commodious dwelling of the same construction was erected, this latter house serving the family for fifteen years, when a good frame residence was built. In those first years of pioneer life, the family suffered many hardships and privations through crop failures, prairie fires, elements of the weather, etc. ; not the least of these were the grasshopper pests that came for three successive years and destroyed every spear of vegetation to be found for miles around; they would come in great dark clouds and swoop down on the fields of verdant crops that were nearly ready for vest, and after their flight nothing but stubble and bare ground was to be seen. Another danger was from treacherous prairie fires that would come upon the settlers almost unaware, and often the family were compelled to fight the flames to save their home and property, and even their lives. Mr. Terry remembers that deer and antelope were numerous in those days and often could be seen in large herds grazing in the open. Mr. Terry was married November 25, 1866, to Miss Josie McKenzie, and Mr. and Mrs. Terry have been blessed with nine children, namely: Elizabeth, Frederick, Sherman, Frank, Richard, Mildred, Ruby, Elsworth and Clyde. Mr. Terry is a prosperous and successful agriculturalist, and now owns four hundred and eighty acres of choice land, and has fifty acres of flue orchard and forest trees. He has one of the finest places in this portion of the county, and his home and family are widely and prominently known. He is a member of the United Brethren church, and an independent voter. William J. Rice is well known as a public-spirited citizen, ready to do his part to advance the interests of Custer county and the state of Nebraska, and is prominent as a member of the republican central committee. He is one of the early settlers of the county, where he was achieved notable success as a stock and grain farmer, and is honored as a veteran of the civil war. He was born in Adair county, Missouri, March 20, 1844, eldest of the seven children of Erastus and Amanda (Mason) Rice, the father a native of Westmoreland county, Pennsylvania, and the mother of Missouri. The father was a soldier in the Mexican war and both parents died in Missouri, he April 23, 1888, at the age of seventy-one years, and the mother January 26, 1874, at the age of fifty-three years. One son lives in Idaho, one son in British Columbia, two daughters live in Missouri, one daughter lives in Oklahoma, one son is deceased, and William J., is the subject of this article. Mr. Rice was reared to farm work and received his education in the public schools of his native place, where he later engaged in farming on his own account. In August, 1863, he enlisted in Centerville, Iowa, in Company L, Eighth Iowa Cavalry, in which he served to the close of the war, receiving his discharge at Clinton, Iowa, in the fail of 1865. He passed through the Atlanta campaign arid was with Wilson on his raid through Georgia, taking part in the important battles of Franklin and Nashville, besides many minor engagements. At the close of the war, having won a very creditable record, he returned to Missouri, and on November 18, 1866, in Putnam county, married Miss Sarah A. Mullins, a native of that state. They spent several years in that state, then came to Nebraska, making the trip in 1887, with their seven children. Mr. Rice secured a homestead on the northeast quarter of section seven, township seventeen, range twenty-three, and pre-empted one hundred and sixty acres adjoining. This has since been the family home and has been brought to a high state of productiveness, being equipped with modern machinery and appliances. In 1909, Mr. Rice erected a handsome modern residence. For the past fifteen years he has served as justice of the peace and filled various township offices at different times since coming to Custer county. He helped organize school district number sixty-one and is now treasurer of same. He is actively interested in all local affairs and has a good standing in the community. Seven children have been born to Mr. and Mrs. Rice: William E., at home; Mary L., wife of Daniel Maupin, of Sterling, Colorado, has eight children; Martha F., wife of William Wardrobe, of Custer county, has five children; Amanda, wife of Douglas D. Shaw, of Custer county, has eight children; James Riley, married and living on West Table, has two children; Charles Elmer, at home; John C., married and living in West Table, has one child. Mrs. Rice's father, Matthew Mullins, was born in North Carolina and died in Missouri in 1871. The mother, whose maiden name was Nancy Guinn, was born in Tennessee and died in Missouri about 1879. Two of their sons, Thomas B. and John W., served in the Eight Iowa Cavalry in the civil war, and the former was for three months confined in Andersonville prison. Mrs. Rice has two brothers in Missouri and two in Kansas. thrift, succeeded in becoming one of the most successful farmers in Wayne county, is Mr. Richard Hanson of Wayne. Although living in town, he is still actively engaged in farming, even to the extent of often driving into the country and remaining a week at a time in order to give his attention to the work in hand. Richard H. Hanson was born in the village of Lugum, District of Tondern, Schlesswig-Holstein, on November 30, 1845. The province at that time was under Danish rule, the sovereignty not passing to Prussia until the close of the war of 1865. As was customary, Mr. Hanson served his three years in the army and had returned home, when a few months later, he was recalled to take up arms in the Franco-Prussian war. During the fourteen months that this war was in progress, he was in the battles of Wirth, Vionville, GraveIotte, Beaumont, Sedan, Strausberg and Metz. A younger brother Fred, fell in the battle of Gravelotte, but Richard and an older brother, William, passed safely through the war. Richard Hanson came to America in the spring of 1872, taking passage on the "Cymbria" on March 6, and landing at Castle Garden twelve days later. He proceeded westward to Davenport, and thence to Muscatine, Iowa, where he found work on the farm of Oliver Silverton. His brother, Hans, wrote him for money in order that he too might come to the much-dreamed new world without delay. Richard's employer accordingly paid him the balance of his five months' wages in advance, thus enabling Hans to start at once. He arrived in Iowa in August of year. He prospered and later owned a farm in Pottawattamie county, Iowa, where he died. In December, 1881, Mr. Hanson was married to Miss Anna Attie Muller, a native of the village of Ditmarchen, Holstein. Her parents, by a strange coincidence embarked on the same vessel which had taken Mr. Hanson to this country four years before they emigrated. The family settled on a farm near Davenport. In the spring of 1882 they moved to Omaha, where the father lived the remainder of his life, and died October 29, 1890, at the age of fifty-nine years. The mother lived there until her death, which occurred January 20, 1911, at the age of eighty-five years, three months and twenty-nine days. After his marriage Mr. Hanson moved to Shelby county, and farmed rented land for three years, but March 5, 1885, found him and his wife, on their own farm about five miles south of La Port, the old county seat, where he bought one hundred and sixty acres at twelve dollars and fifty cents per acre: He began at once to improve this open prairie land, first building a small house, then adding sheds and barns as occasion demanded. An orchard and groves were started and soon he had a very thrifty looking farm. In 1895, a large addition was erected, making the farm house very roomy and comfortable. The original farm has since been increased by the purchase of an adjoining quarter section. He has also purchased a quarter section of fine land about seven miles southeast of Wayne. In 1907, after living twenty-two years on the farm, he moved to Wayne and is now taking life more easily than heretofore. Mr. Hanson's parents followed their children to the new world in 1882, making their home with one or another of their children. The father died at Minden, Iowa, on February 20, 1896, at the age of eighty-two, and the mother died at the age of seventy years, two months and sixteen days. Mr. and Mrs. Hanson have had six children born to them, all of whom are living: Hans J., occupies the old homestead; Regina, now Mrs. Alfred Hass, is in Iowa county, Iowa; Catherine, Anna, Richard H., junior, and Harry are still at home. In politics, Mr. Hanson is a democrat and he is also a member of the Lutheran church. He is an associate of the German army societies and attends their meetings in Omaha, talking over with old comrades the days of trial in the trenches and in the open fields. He has several medals made from the bronze, of captured French cannon, which commemorates deeds of valor done in the heavy battles of the Franco-Prussian war. Although they did not come to Nebraska until 1885, still Mr. and Mrs. Hanson have, many stories to tell of their trials here, which includes reminiscences of the days when they had to burn twisted hay and corn for fuel. Mrs. Hanson has had the experience of learning English since coming to this state, and can now read, write and speak that language as fluently as her children. The above named gentleman is one of the old settlers of Nebraska, who came to this state when it was practically in its infancy and has remained to see it grow from a wild prairie to the fertile mid productive country it has now become. Frederick Laub, son of John Phillip and Anna Maria (Groff) Laub, was born in Germany, November 30, 1841, and was third of thirteen children, of whom one sister resides in Kansas, one in Omaha, one brother in Clarks, Nebraska, and another in Chapman. The parents are deceased. In 1848 our subject came with his father and family to America, locating in Illinois, where Mr. Laub received his education and later engaged in farming. On February 1, 1869, Mr. Laub was married to Katherine Nordeen, of Illinois. She died March 31, 1870, survived by her husband and one son, Leonard, who died a few months later. dred and sixty acres in section thirty-two, township thirteen, range seven, where he resided about fifteen years, and in 1886 retired from farming and moved to Chapman where he built a good home and where he now resides. On November 22, 1874, Mr. Laub was married to Mrs. Mary McCatheron of Wisconsin. Two children were born of this union: Gertrude, who is married to Harry Easter, has four children and lives on the father's homestead; and Edna, who resides at home. Mrs. Laub died January 31, 1901, at her home in Chapman. Mr. Laub has been prosperous and successful, owning two hundred and forty acres of fine farm land, as well as good city property. He is one of the earliest settlers in this portion of Nebraska, and has passed through all the trying experiences and discouragements of frontier life; and is widely and favorably known. In November, 1864, Mr. Laub enlisted in Company I, One Hundred and Forty-eighth Illinois Volunteer Infantry, serving until the close of the war, when he received his honorable discharge September 18, 1865, at Springfield, Illinois, having been mustered out at Nashville, Tennessee, September 5, 1865. While in service he was on guard duty mostly in Tennessee. Mr. Laub served on the school board of Chapman schools four years, and is widely and favorably known as a citizen who is always interested in the welfare of his home county and state. Jacob Laub, deceased, brother of the subject of this biographical writing, was born in Germany, April 29, 1846, and his personal history is identical to that of his brother's above mentioned until the spring of 1872, when he came to Merrick county, Nebraska, and homesteaded eighty acres of land in section twenty-eight, township thirteen, range seven. On October 31, 1875, Mr. Laub was married to Loa Fishburn, of Iowa, and from this union six children were born: Jennie, who is married to Roy Dunn, lives in Hamilton county, Nebraska; Vida, wife of Frank Clark, has four children and resides in Merrick county; Eva, who is married to Anson Holmes, has four children and lives in Perkins county, Nebraska; Anna, wife of Clyde Clemens, lives in Longhurst, Colorado; Nina, who resides at home; and Fred N., who is married and lives in Merrick county. Mrs. Laub has four brothers residing in Nebraska, two in Colorado, another in the state of Washington, where one sister also lives, and one sister in Colorado, and a brother in Merrick county. Her father died September 30, 1907. Mrs. Laub now resides with her mother, Mrs. David Fishburn, near Chapman, surrounded by a large circles of friends. Mr. and Mrs. Laub were among the early settlers of the county, and passed through all the trying experiences and hardships incidental to pioneer life. Mr. Laub was prosperous and successful and owned one hundred sixty acres of good farm land. In the early days he served as precinct constable, and also was one of the organizers of his school district and served as director of the same a number of years. He retired from the farm in 1884 and moved to Chapman, where he lived until the time of his death, which occurred March 9, 1885. He was survived by his wife and six children. Few men have been privileged to enjoy so wide a range of travel, to participate in as many varied phases of life, and be personally acquainted with so many well known men as Mr. H. J. Kimball of Creighton. He has mingled in political life in the east; ridden the range as a cowboy in the west; stood in the marts of the new world's great cities, and sailed the seas to foreign lands with an elderly friend of his father's who was like an uncle to him. H. J. Kimball was born in Bangor, Maine, February 8, 1847, the son of Captain Asa and Mary A. (Piper) Kimball of Bangor, Maine. Captain Asa Kimball was a ship builder in the old Pine state at a time when American clippers invaded every sea and outsailed the ships of all other nations. At the outbreak of the civil war he raised a company of the Twelfth Maine Infantry and was elected captain; for his services on the staff and on detached duty he was brevetted colonel. His career was ended in one of the battles just a week before the surrender at Appomattox, and he lies buried at Atlanta, Georgia. He was an intimate acquaintance of James G. Blaine, Hannibal Hamlin and other notable men of New England, and had not the accident of battle cut him off in the prime of life would no doubt have won distinction in the councils of the nation. The son, H. J. Kimball, later enlisted at the age of sixteen in the First Maine Heavy Artillery, under Colonel Daniel C. Chaplin and Major Charles Hamlin, son of the vice president, and participated in some of the hottest battles of the civil war. In the three day's siege of Petersburg his regiment lost sixty-six per cent of its men in an action of but twenty minutes' duration; the greatest death loss of any engagement in the history of the world. Among the general engagements in which Mr. Kimball participated were Spottsylvania, North Anna, Topopotomy, Petersburg, Jerusalem Road, Deep Bottom, Weldon R. R., Boydon Road, Hatchee's Run and Saylor's Creek. travel that could never have been gleaned from years of reading in books. When a young man he was employed by the well known capitalist and manufacturer, Robert B. Seaman, to promote the use and sales of the "iron clad" can in the dairy country tributary to New York. For twelve years he held a desk in the treasury department, at times taking part in political campaigns, being in close touch with old comrades of the tented field and wielding a strong influence with them. In the same office where he sat, Julius Rathbone, who later wrote the ritual of the Pythian order, and he conferred upon Mr. Kimball the degrees as they were given when the order was in its infancy. Coming west in the spring of 1884, he became the first industrial teacher of the Yankton Indian school at Greenwood, South Dakota, near Fort Randall, and while here became intimately acquainted with Charles Conger, son of the senator and minister to China. Coming to Creighton in April, 1885, Mr. Kimball for a time did with his might what his hand found to do, and later became foreman in Holbrook & Freeze's lumber yard. In 1895, he spent several months riding the range on the Smith ranch at Cottonwood, South Dakota, and later on the "Bar T" and "Cross Anchor" ranches. Mr. Kimball. was married in Washington, D. C., July 16, 1873, to Miss Avadela Lewis, born in Remson, New York, daughter of Lafayette and Hannah (Herron) Lewis. Her father died when she was quite young and the mother removed to New Jersey, where Mrs. Kimball was reared. They have a well kept cottage home which compares favorably with any of its class in town. Three children have been born to Mr. and Mrs. Kimball: Hattie E., is the wife of William Rafferty, of Chicago; Harry J., of Portland, Oregon, married Mrs. Margaret Zimmer, whom be met while settling the estate of her late husband, and they have property in many of the larger cities throughout the western states; Gertrude A., lives in Creighton, her husband, Frank Hufsmith, being one of the business men of the town. They have two children: Ava A., and Janice K.
Mr. Kimball has experienced many of the vicissitudes of western life, and one that came nearest being tragedy occurred in the blizzard of January 12, 1888. Going to the school for his children, he started home a short distance north and found himself with his little ones several blocks to the east on the banks of the creek; he finally made his way home with the young folk, but all were chilled through and nearly exhausted and smothered by the ice dust that was driven through their clothing, and into their eyes, nose and mouth. The last few years Mr. Kimball has been engaged in house painting and has won success in his business by square dealing and efficiency. He is a republican in politics; one of the early members of the Pythian order, and a comrade of the Grand Army of the Republic. He attained some skill as a drummer, and is called upon on gala occasions to rattle the snares for the Grand Army of the Republic. Elihu T. Long, owner of a valuable farm on section twenty-one, of Beaver precinct, Boone county, is a pioneer agriculturalist and stockman of that region. Mr. Long was born in Iowa county, Iowa, on May 8, 1855, the youngest of five children in the family of James H. and Francis Long. He received his early education there, and in May, 1871, in company with his father and brother, Windfield S., came to Boone county, the father and brother each taking up homesteads. In July of that year they went to Iowa and brought the family back with them, landing in Boone county in October. Here they went through the usual pioneer experiences, our subject remembering well the early days when they suffered privation and hardship by reason of the inability to get many of the necessities of life, being obliged to haul all supplies from Columbus, etc. Our subject filed on a homestead for himself as soon as he became of age, settling on section twenty-one, township nineteen, range five, which is still his home farm., comprising three hundred and sixty acres, having good buildings of all kinds, groves and orchards, and is one of the valuable estates in that part of the county. Mr. Long was married on March 14, 1894, at the home of her parents in St. Edward, to Miss Anna Warner. To them have been born three children: Forrest B., Asher D., and Elihu T., junior, all now at home and attending the local schools. Mr. Long's first poll tax was worked out on the public highway joining his father's homestead, and in his fiftieth year he worked his last poll tax on the same highway. He is a wide-awake man of affairs in his locality, and has made a decided success of farming and stock raising. He is familiarly known to his friends as "Hoot" Long, and is one of the old landmarks and leading citizens of his county. A typical old settler of the state of Nebraska is represented in the gentleman above named, H. Fulton, who has lived many years in this section of the country and has been a part of the growth and development of this region.